It really has been a tale of two seasons for the Boston Blitz. After storming out of the gates with three straight wins, Boston has become the master of the drawn match ever since. Excluding a single win against San Francisco and their only loss of the season to New York (while using a lineup without GM Christiansen or Perelshteyn), the team has been stuck on 2-2 match scores. The draw left Boston tied for first in the Eastern Division with the Philadelphia Inventors, making this week's matchup between the two teams a very meaningful one. However, in an interesting twist of fate, the team that has mastered the drawn match this season, finds itself in a position where it can "draw" itself all the way to the US Chess League Championship match. How so? Since Boston defeated is ahead of Philadelphia in game points earlier in the season, they need only a draw to secure 1st place in the Division and the first round playoff bye which comes with it. Then in the second round, they will have draw odds against their opponent, so two points will be enough to secure themselves a spot in the finals. I suppose if this comes to pass, it will be safe to assume that the Blitz will draw the Championship match with the Western Division representative and go to tie breaks. Of course, the tie break games will be drawn, so eventually the league will use an Armageddon game to decide a winner (actually it doesn't really work with this way I'm not sure how the league plans to break a tie if last year's tie break model doesn't decide it, but bear with me for the sake of thematic continuity). Here the critical moment will be reached. One way or another, Boston must somehow get the Black pieces and then take home the crown by holding on for a draw! Looking at the lineups for this week, it seems quite likely that the Blitz will be able to secure at least a draw. In fact, I can't see one Board where the Inventors have a clear edge. The only real question seems to be whether Williams is ready to rebound from his back-to-back defeats in Weeks 7 and 8. Boston gets the White pieces on Boards 1 & 3. Braden Bournival has a piece on why Shmelov should be considered the MVP of the Blitz. In it, he explores the "3-GM" lineup concept we mentioned back before the season started and makes what might be considered a roster strategy recommendation for the 2008 season (assuming Blitz manager Phelps can find next year's edition of Bennet Pellows). Apparently that's going to be one of the highlights of GM Larry Christiansen's day long visit to The Chess Club in Kansas City, Missouri on Saturday, November 3rd. Here are links to the details of the event and to a menu from the Smokehouse BBQ. Steve Stepak reunites with Garry Kasparov after 18 yrs. Can you put my favorite photo on the BCC web page? 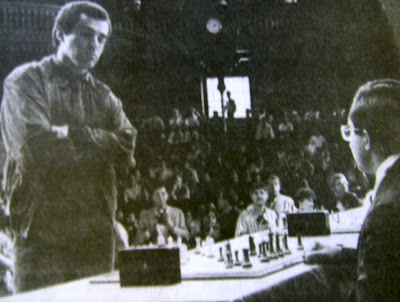 The photo was taken by a friend who wishes to remain anonymous just after I was conversing with Kasparov as he signed his book for me; I was reminiscing about Fall of 1989 when he came to Harvard to give talk at Russian Research Center and an 8 board master clock simul at Sanders Theatre: 7 humans and a computer. Garry won all games. I reminded Garry that one of the photos I took of him doing his simul appeared on the cover of Chess Horizons that Winter !! Garry facing off with now IM Vivek Rao! at Sanders Theatre. Kasparov was happy to remember this visit, after which we were inspired to seal our memories with a handshake. And here you see it. Real smiles on both sides because 1989 were happy times, Perestroika and Glasnost appear on USSR horizon. Garry introduces Cambridge audience of 1989 with these terms; and now 15 Oct 2007 18 yrs later, Garry delivers a highly appreciated and well-applauded speech on life on and off the chess board at First Parish Church, Cambridge, MA USA. With one week left in the regular season, the four teams that have clinched playoff berths have separated themselves from the field in the most recent edition of the Original US Chess League Quantitative Power Rankings. At the other end of the list, Tennessee, despite their improved play as of late, has secured the bottom spot for the 2007 season. If the QPRs are right, then Seattle and New Jersey will lock up the remaining playoff spots next week and New York, Baltimore and Miami will have to wait until next year. Dallas (7.0, .883, 1st) - Only a Destiny loss and a Blitz win next week can challenge Dallas' lock on the top spot. Boston (6.0, .820, 2nd) - The Blitz hold the edge over the Inventors in game score and performance rating. While Philadelphia has higher scores in momentum and strength of schedule, these factors are weighted less heavily in the model. Seattle (4.5, .533, 3rd) - The Sluggers are ahead of the Knockouts in game score, performance rating and strength of schedule. New York (4.0, .514, 6th) - The Knights actually have a lower game score than the Kingfishers, but have the edge for all the other variables. Queens (3.5, .429, 8th) - The Pioneers ranking ahead of the Sharks is primarily attributable to strength of schedule. Queens has faced the toughest schedule in the league, while Miami has had the second easiest one. Carolina (3.5, .312, 10th) - Remember back in week 4, when the Cobras were ranked 4th? Should the US Chess League update the polls on their website? The US Chess League has polls on their website? If I were you, I wouldn't bother stopping by here tonight for updates on the chess. Can the Blitz wrap up a playoff spot? 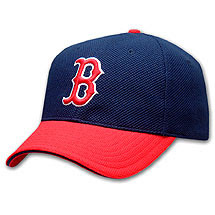 - OrangeKing can take you through the specific details, but suffice it to say that this is almost certainly going to be the week that Boston punches its ticket. In fact, there are scenarios where the Blitz lose tonight and still clinch a playoff berth. Where does the Division race stand? - Only a Boston win and a Philadelphia loss will wrap up the Eastern Division race. Therefore, it is very likely that next week's Blitz-Inventors match will be meaningful. Welcome back, Mr. Perelshteyn - We haven't seen much of Eugene this season, but Manager Matt Phelps likes to trot out the two GM lineup when he really wants (needs?) to win. While SM Sammour-Hasbun has certainly established himself as a formidable Board 2 this season, it will be interesting to see what kind of form GM Perelshteyn is in as the post-season approaches. Possible Board 4 controversy - Has Phelps lost faith in the bear or is he just giving NM Williams a week off after two straight losses? The usual "availability" excuse won't fly this time, since we know for a fact that Chris is available. In any case, it gives us another chance to see Ilya Krasik on Board 4, which is almost never boring. David Vigorito (6.5 of 7) continued on his ineluctable march to the Championship - he needs only a draw in the remaining two rounds to clinch. Paul MacIntyre (5.5 of 7) and Charles Riordan (4.5 of 7) will try to stop the juggernaut as they play the last two rounds with the IM. 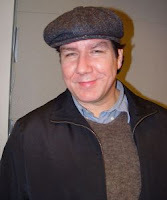 In the Hauptturnier, Carey "the haupt-vigorito" Theil is now 7 of 7, having just defeated his chief rival, David "the blog meister" Glickman (5 of 7). Eddie "the cicada" Chisam is trying to repeat his ten year cycle (5 of 7) and Ken Newman (5 of 7) is hanging back waiting to make his move if Carey falters. 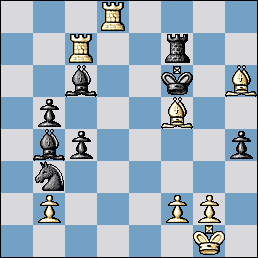 Here is a position from the 5th round of the BCC Championship with White to move. After wrestling with the position for awhile, highlight the space between the brackets for the game continuation. From "Nakamura Breaks Out" at thepHtest. As goes the lower boards, so goes the Boston Blitz. At least, that's the way it seems these past couple of weeks. Earlier in the season when Boston was tearing through the league it most often seemed that excellent performances from Shmelov and Williams were the keys to victory. In fact, both were mentioned as 1st Team All Stars at the halfway point in the season. Against the New Jersey Knockouts last Wednesday night, just a half point on Boards 3 and 4 combined was not enough to push Boston over the top. Instead, the Blitz had to settle for a draw and must wait at least one more week to clinch a US Chess League playoff spot. While one would hardly be justified in calling out Denys for his recent performances -- he's 1.5-0.5 over the past two weeks including a win over the New York Knights' IM Jay Bonin -- he did nonetheless have the best of it for awhile against NM Evan Ju before having to settle for a draw. 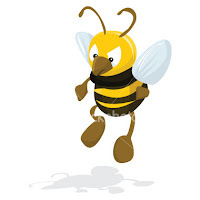 So perhaps the bee just needs to sharpen up his stinger a bit. 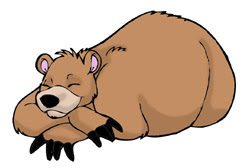 On the other hand, the bear has clearly gone into hibernation. The previously awesome one, NM Williams, is now 0-2 in the last two weeks after losing with White to NM Victor Shen. Did you just ask, "Where's Ilya?" The loss for New Jersey on Board 2 was fortunately balanced by a win on Board 4 by the young Victor Shen in a wild game where both sides created second Queens. Shen has struggled against his usually more mature opponents, but this game showed him at his best. Speaking of Goeller, one of the good things about playing New Jersey is that Michael annotates all the Knockouts' games. Check out his notes on the match with the Blitz. Enough dwelling on the negative... Boston maintains a half point lead over second place Philadelphia and are still odds on favorites to take the Eastern Division regular season crown. So, rather than looking at where Chris might have gone wrong, let's instead take a look at a couple of positions from Jorge's impressive win on Board 2. His game is a great case in point for why you shouldn't spend all your time studying openings. Although Jorge played a line that didn't offer much compensation for his sacrificed pawn, he subsequently outplayed his opponent once they were both on their own. 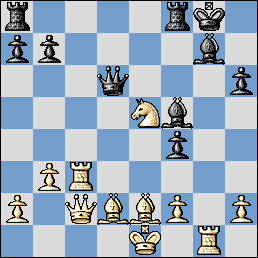 I particularly like this position with White's knights standing side by side and dominating the board. 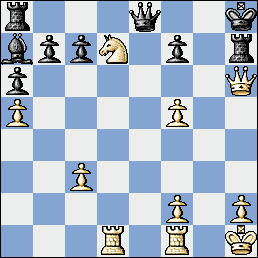 Nevertheless, I'm not sure I would have found Jorge's next move, 20.g4. This next position contains a nice, straightforward tactic which allowed White to win the exchange and eventually the game. 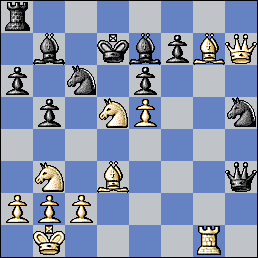 Solution: 30.Qxh7+ Kxh7 31.Nf6+ forking the king and queen. With Boston only achieving a draw, Dallas' revenge win over Seattle has vaulted them into the top spot in the QPRs for the first time this season. As I anticipated last week, rankings in the middle of the pack remain quite volatile. Seattle (4.5, .714, 3rd) - Despite losing to the Destiny, the Sluggers edge in game score, performance rating and strength of schedule kept them percentage points ahead of the Inventors. San Francisco (4.0, .622, 7th) - The Mechanics lead the other 4.0 teams based on a much higher game score. Queens (3.0, .437, 9th) - Surprisingly, the Pioneers rank ahead of both 3.5 teams due to strength of schedule and a higher momentum indicator. It has been up for about a week, so I would imagine that most of you have already come across the second edition of the Chess Blog Carnival at Samurai Chess. Nevertheless, Jack Lemoine asked me to give it a plug and I'm happy to do so. That had to be one of the strangest Annual Members' meetings I've attended in a long time. 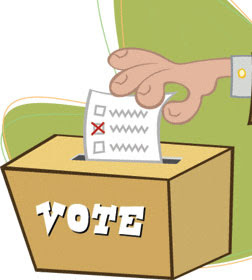 There were many reasons, but I'll just mention the most obvious -- an actual Club Officer election took place! Incumbent BCF President FM Paul MacIntyre faced a challenge from long time member and former Officer, Board Member and Club Champion FM Chris Chase. 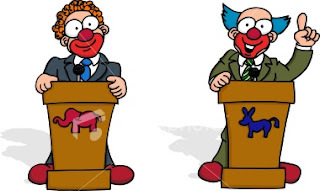 Prior to the vote, much discussion was had, between the two candidates and among the assembled members, about current issues and future directions for the foundation and the club. Members variously expressed support for both candidates and the outcome of the eventual balloting was very much in doubt. Voting was done by secret ballot and I had the privilege of tabulating the results with the assistance (and under the watchful eye) of Ted Gorcyzca. The count was rather eventful itself. Chase got off to a strong lead, but as more votes were unfolded MacIntyre slowly came back. Finally, the two were dead even with only two ballots remaining to be counted. Already I was thinking about what we might need to do to break a tie ... a second vote? rock, paper, scissors? Someone mentioned a Blitz game. The last two ballots were unfolded and they were both for Paul. A tie had been averted, but it sure was close. I was thankful that there were no demands for a recount. Only three rounds to go and David Vigorito maintains his one point lead over Paul MacIntyre. The two are scheduled to meet in Round 8. Charles Riordan has moved up the leaderboard the last few weeks and now finds himself in sole possession of third place. He faces MacIntyre next week. Several Round 6 games were postponed due to the Kasparov event. As a result, only 4 players have completed a full schedule to date. Of those, David Glickman continues to lead Eddie Chisam and Ken Newman by half a point. Carey Theil is still lurking with an undefeated record and two games to play. Next Monday's matchups include Glickman-Theil and Chisam-Newman. Here is a clip of Garry Kasparov's appearance on The Colbert Report (not sure how long it will be up). Please note that the starting time for tonight's Boylston Chess Foundation Annual Members Meeting has been changed. The meeting will now commence at 8:00 pm. Ok, this is not the greatest game ever, but it is one free of major mistakes, and an opportunity to take a look at the Cambridge Springs Defense. Glickman chooses the Cambridge Springs Defense. 9...... Nxc3 10. bxc3 Na4! 19..... Bc5 20. Rfc1 Bb6 21. 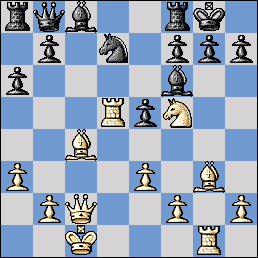 Kf1 Bxa6+ 22. Rxa6 f6! On the "grown-up" front, New England also has a leading combination in the Boston Blitz team in the US Chess League. As of late last week, Boston Blitz was leading the Eastern division by one match, warding off the Baltimore Kingfishers by one point. The game of the week was that of two ex-US champions: Larry Christiansen against our own Patrick Wolff, who is playing first board for the San Francisco Internet team. Christiansen won. San Francisco nevertheless won the match. Boston Blitz draws on a reservoir of strong players, especially Christiansen, Grandmaster Eugene Perlshtyn [sic], and Jorge Samour-Hasbun [sic], the Internet Chess Club blitz champion. The team is rounded out by Bill Kelleher, Denys Shmelov, Vadim Martirosov, Chris Williams, and Ilya Krasik. There are four more weeks to go and then hopefully the playoffs. The Chess Notes column goes under the by-line of Harold Dondis and Patrick Wolff, though it is generally understood that Harold writes the articles and Patrick annotates the games. In this case, we can only assume that Wolff's wishful thinking led to the error regarding the outcome the Blitz-Mechanics match. After a one week hiatus, the Blitz have again brought out a big guns lineup for this week's match with New Jersey. Of course the Knockouts have a competitive lineup as well. Boston has a slight average rating advantage (2412 to 2397) and gets White on Boards 2 and 4. While Arun Sharma is going to predict a relatively easy 3-1 win for the Blitz (unless he changes his mind before he publishes his draft post), I wouldn't be surprised if New Jersey puts up a tough fight since their playoff hopes are on the line. The Annual Membership Meeting of the Boylston Chess Foundation takes place this Wednesday, October 17th at 7:00pm. At the meeting, Officers and Directors for 2007-8 will be elected. Don't miss your chance to "throw the bums out!" Despite Boston Blitz Manager Matt Phelps claims to the contrary, it's hard to believe that he was comfortable sending out a GM-less team with a 100-point average rating deficit to face Eastern Division rival New York in last Wednesday's US Chess League action. Of course, if it is true that neither GM Christiansen nor Perelshteyn were available (and there is no reason to think otherwise), then he didn't really have much choice. Yet, the match almost broke in a way which would have left Phelps lauded as a lineup genius, prophet, or just a really lucky guy. If you knew upfront that Nakamura would do no better than a draw on Board 1 and that Shmelov would defeat Bonin on Board 3, wouldn't you have to conclude that the Blitz ran little risk of losing the match? After all, Williams is a 2300+ player disguised behind an expert's rating and he's been tearing up 4th Board opponents all season. Surely, he wasn't going to maintain a perfect record forever, but there was no reason to think that he would lose this game against the Knights. Alas, Chris simply wasn't quite as awesome as usual (see Braden Bournival's possible explanations why). Let's take a look at where he fell down. 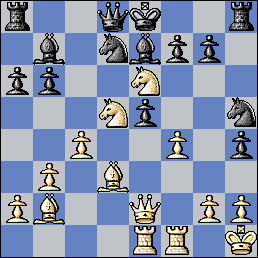 Here Chris opted to kick the knight and blunt White's g-file pressure with 20...g6. However, Fritz thinks he might have done better to start attacking on the queenside immediately with 20...b5. After 21.Bb3 Ra7(!) 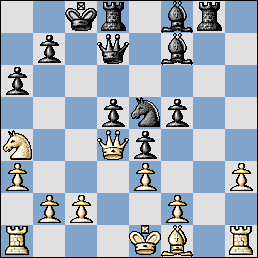 22.Qd3 Rc7+ 23.Kb1 b4, Black looks to be making some headway against White's King. 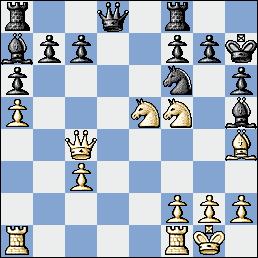 In this critical position Black blundered with 24...Bxb2+? 25.Kxb2 Bf5, missing 24...Bf5! immediately (as pointed out by Greg Shahade in the Game of the Week post). 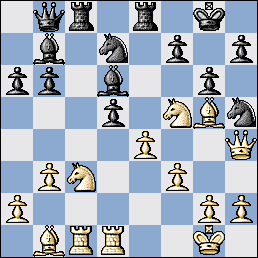 After 24...Bf5, the computer suggests the following continuation -- 25.Rxf5 Qe7 26.Kb1 Rfc8 27.Qd1 Nc4 -/+. Jorge's performance on Board 1 has to be comforting for Blitz fans. It seems easy to conclude that whether he or Perelshteyn sits down at Board 2 during the playoffs, Boston will be playing with a two GM lineup. As for Nakamura, the highest rated player in the league remains winless in league play. I can't imagine that when he was recruited to play for New York, Knight's management was looking for someone who would get more press for his prognostication skills (not that guaranteeing a win when your team has a 100-point rating advantage takes all that much skill) than for his results at the board. I don't think Kelleher should even be credited with the loss against Charbonneau. After what Pascal has done to Boston's GMs, how was it even fair to throw Bill into the ring with him? Instead, I'd give the zero to Phelps; in baseball, they'd call it an intentional walk. I'd appreciate a master's perspective on the Shmelov-Bonin game. 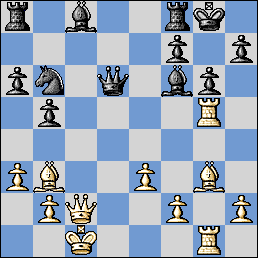 It seemed to me that after the Queens came off, Denys had a nice initiative in the double Rook ending. But I'd be interested to learn whether the win ultimately flowed from the the successful prosecution of that advantage or whether Bonin subsequently blundered away a drawn position. Either very few people read FM Ron Young's USCL Predictions or the political correctness police have gone on vacation. I always thought I was playing it close to the edge when I referred to one of the 2400 average rating exceptions as "10 points for girls." But if that's true, then Ron went right over the cliff with his description of the same in his Week 7 predictions post (see Seattle vs. Dallas). Boston and Dallas continue to hold the top spots in the QPRs despite losing their matches last week. However, Seattle finds itself in a virtual dead heat for 2nd. The Blitz retain the number 1 position with the highest game score and performance rating in the league. The teams ranked 5 through 10 seem fairly interchangeable and are all fighting for the last playoff positions. It wouldn't be surprising to see significant variability in the rankings of these teams over the next couple of weeks. For now, New York holds the highest spot in this group due to momentum (they are 2-0 in the last two weeks) and strength of schedule (to date they have faced the toughest schedule in the league). On the other hand, New Jersey finds itself in 10th largely because it has faced the easiest schedule so far. Congratulations to chess blogger Simone, who won a Girls - 8 and under gold medal at the 2007 North American Youth Chess Championships in Mexico. When did they do their opening prep? This might be the biggest thing to hit the chess blogosphere in awhile. ChessGirls isn't another one of those chess beauty sites exactly. Instead, it provides coverage of the Dutch team at the 2007 European Club Cup for Women. However, it seems that whenever the team of WIM Marlies Bensdorp, Arlette Van Weersel, WFM Laura Bensdorp and Martine Middelveld weren't busy playing chess, they were doing photo shoots and filming footage for a video production. With just four rounds to go, only FM Paul MacIntyre remains within a point of the leader, IM David Vigorito. Greg Kaden's remarkable unbeaten streak finally came to an end against NM Frank Wang. Games from the first four rounds of the Championship are now available for replay. Less than half the field has completed their full schedule to date, making it somewhat difficult to determine the actual standings. Of those who have played five games, David Glickman leads Eddie Chisam and Ken Newman by a half point. However, Carey Theil has a perfect score with two games in hand. I've had a post about Susan Polgar and Sam Sloan in draft for about a month but haven't posted it because I've been busy with other topics and because I thought it might just be a gratuitous attempt to create controversy out the fact that the two simply see the world very differently (not that I have any problem with gratuitous controversy, mind you). However, now with the blogosphere and mainstream media all in flames over Sloan's lawsuit against Polgar, I figure I can slip it by without much notice. I'm reminded of the time that Dennis Monokroussos' blog got spammed with pro-Polgar comments. All of this makes one wonder who might have been the culprit in that case. How did the USCF Chairman position come about? What is your opinion about these new titles? After the new board was elected, there were two candidates for the position of President, current President Bill Goichberg and myself. We each have our own strengths and weaknesses. Bill and I discussed this situation at length to come up with the most efficient way to maximize our talents to best help the USCF. In addition, we have a very unique board with exceptional talents and expertise in various areas that can greatly help the USCF. So the idea of creating different positions arose. Bill, with decades of experience, knows the ins and outs and the structure of the USCF quite well. I am best in my own environment, which is to be the public face and voice of the USCF to positively promote chess and deal with potential supporters and sponsors. The USCF by-laws committee and Mr. Harold Winston were consulted about the legality of this idea. They came to the conclusion that there is nothing in the USCF by-laws that would prevent it. Therefore, in the first meeting of the new board, this idea was proposed and we had unanimous votes for every position. This was a triumphant first step to unite the board, especially after a very bitter election. Of course, all this fluff about unique expertise and maximizing individual talents is just spin. Nevertheless, it seems like a clear blue sky compared to how things used to work. Polgar and Truong ran for election with the obvious plan and intention to [sic] taking control of the USCF through their four-person slate. They must be deeply disappointed now that things did not turn out the way they had hoped. They must be especially disappointed in Bauer for voting against them on several key votes. Susan wanted to be president but Bauer voted against her, so she could not get enough votes. She took the honorary title of Chairman, which is an unofficial title with no powers or duties and is not recognized in the by-laws. What they will do I will not know but they are certainly not happy. Now, I certainly wouldn't hold up Sam Sloan as any paragon of truth and virtue. Nevertheless, it makes one wonder if team Polgar is being as upfront as they claim to be. One week I compliment the team for their heightened sense of competitive professionalism, and the next they choose to eschew a lineup advantage in order to compete for the US Chess League's 2007 Miss Congeniality Award. The [Blitz-Mechanics match] this week was originally scheduled for Monday but was moved to Wednesday at the request of the San Francisco team, primarily due to various of their team members playing in the Miami Open Tournament this past weekend. To show sportsmanship (something that some teams in the league feel the Blitz don't do), and in the interest of fair play, the Boston Blitz agreed to this request, despite two of their top players, GM Eugene Perelshteyn and Jorge Sammour-Hasbun [being] unavailable on the rearranged day. Fair play? This gesture went well beyond fair play. The Blitz agreed to diminish the strength of their lineup in order to enable their opponent to strengthen theirs. Just imagine what fans would be saying if Boston had lost the match. But, of course, they didn't lose. Instead, the Blitz defeated last year's Champions 2.5-1.5 and will now be known around the league as the friendly, caring team that still beats you to a pulp. Are they lucky, or are they really this good? I'd just as soon play it safe. So, if during the playoffs, one of their opponents asks for a similar favor, I'd suggest that Manager Matt Phelps ask himself one simple question, "What would Bill Belichick do under similar circumstances?" Even after the move was on the board, it still took me awhile to see the underlying idea (of course, this says more about my lack of tactical vision than anything else). After this shot, things went rapidly downhill for Patrick, though it was still quite instructive watching how efficiently Larry put the game away. IM Bhat got the best of FM Kelleher on Board 2, but rather than comment on the game, I'll direct you instead to Braden Bournival's excellent annotations. The final nail in the Mechanics' coffin came on Board 3 where, try as he might, IM Donaldson couldn't breakthrough against NM Shmelov and eventually had to acquiesce to a draw. By the way, I understand that the Blitz will be sending lovely bouquets to each of their opponents prior to this week's match. Maybe you've heard -- they're known to be friendly and caring like that. Unsurprisingly, GM Christiansen's win over GM Wolff was awarded Game of the Week honors, while NM Williams' game placed 5th. OrangeKing's latest MOP standings have Christiansen in 2nd place and Sammour-Hasbun in 7th. Meanwhile, the league's MVP rankings have four Blitz players in the top 10. NM Sharma has the Bee and the Bear (Shmelov and Williams) on the 1st team of his Mid-Season All Stars, and Christiansen and Sammour-Hasbun on the 2nd. ...which might go a long way to explaining the angst that BlueEyedRook is currently feeling. Of course, Boston doesn't really need any help from Hades; they have Ilya Krasik, after all. In another sign of remarkable kindness, Boston Manager Matt Phelps has pretty much handed this week's match to New York with a particularly weak lineup. Of course, Phelps will blame it on availability, but if former Sluggers' Manager Clint Ballard were still around I'm sure he'd be wondering what the commissioner used as leverage to force more parity into the Eastern Division playoff race. The Knights take an almost 100-point average rating advantage into the match, though I don't necessarily see a rout. Williams should be just fine on Board 4 and Shmelov did manage to draw Bonin from an inferior position earlier in the season. Nobody from the Blitz defeats Charbonneau, so expectations for Kelleher will be extremely low. For Boston, it will come down to whether Jorge can replicate his GM killing ways from the On-Line Chess Championships. If not, it's likely to be an unsatisfying night for Boston fans. For New York, however, the pressure is on. If they can't win a match with this kind of advantage, then their season must really be over. The San Francisco Mechanics pulled off an interesting feat this week. They lost their match to Boston but still maintained their position in the Original US Chess League Quantitative Power Rankings, ahead of a couple of teams with better match records. Math can be fickle, of course, but in this case it comes down to the other numbers. Through six weeks, San Francisco is ahead of Baltimore and New Jersey in game score, performance rating and strength of schedule. These factors combined to offset their half-point disadvantage in match score. Boston and Dallas, both winners, continue to lead the way. While the momentum indicator points the Destiny's way, the Blitz have the edge in game score, performance rating and strength of schedule. In fact, Dallas has so far faced the easiest schedule in the league. The other major development between seasons is that there has been an inauguration of a Blogger of the Year prize worth $100 for, oddly enough, the best blog over the course of the season in an attempt to get people writing about the league and its progress. Consequently, there seems to be much more written about the league this year than ever before. I'm not sure whether the existence of the prize had much to do with it, but if so then it's probably the best $100 spent yet by the USCL. As stats-obsessed people are wont to do, there are all sorts of power rankings, predictions and miscellaneous numerical geekery. [DG] of the Boylston Chess Club posts his own quantitative power rankings; I note with a smile that it only took some wise-guy a few hours to respond, referring to the Glicko rating system, "Where's Mark Glickman when you need him?". [DG] also posts this list of USCL-themed blogs and I guess I'd probably put him in the lead if I were to post some USCL Blogger of the Year Power Rankings, by the very slim margin of four Haloscan links and a blogroll to three game diagrams and a customised forum. Whether or not we are fortunate enough to win the award this year, it's heartening to get a vote of confidence from elsewhere in the 'sphere. 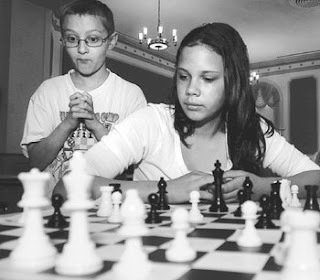 As for the $100, the Boylston Chess Foundation has many worthy projects that could benefit from it, including support for inner city school chess programs, our free chess lessons for kids, and programs to encourage youth participation in tournament chess. Speaking of which, if you are enjoying our USCL coverage on the blog, you might want consider making a tax deductible contribution (money and/or chess supplies) to the Foundation to support our outreach efforts. You can learn more about the Boylston Chess Foundation here. With the new scholastic chess season upon us, Chessdad64 probably realized that many readers would be going through 64 Square Jungle withdrawal. While he hasn't decided to return to his days of active posting, he was kind enough to pass along a post which embodies the spirit of his blog. Read "Expert in Residence" at A Round Unvarnish'd Tale. IM Vigorito continues to lead the Championship by a full point, however, all the talk is about his 4th round opponent, Reubens-Landey qualifier Greg Kaden. Still the lowest rated player in the field, Greg remains undefeated and tied for 2nd place after holding Vigorito to a draw -- something none of the Masters have been able to do so far. While I haven't reviewed the game myself, I'm told that Greg uncorked a nice exchange sacrifice which turned his bishop into a monster. You'll notice a slight change to how the standings are displayed. Going forward, those players who have fallen behind in their schedule will be listed after those who have completed the requisite number of rounds to date. David Glickman and Ken Newman share the lead by half a point over Eddie Chisam, though several players, who have only played two games to date, could make their presence known among this group as they make-up postponements. 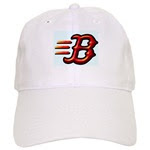 The Boston Blitz are on pace for their second excellent regular season in a row after drawing a match with Baltimore and retaining a full point lead in the US Chess League's Eastern Division. However, listening to an interview with a couple of their players, the dominant theme seems to be one of disappointment. They seem to believe that they ought to win every match and clearly aren't happy when they don't. This, by the way, is an excellent attitude for a professional team to have. Last Wednesday's match was a perfect case in point. GM Christensen had GM Blehm on the ropes and, by his own admission, let him off the hook in both the middlegame and endgame. NM Martirosov had a nice game going, but after his flashy 16.Qxf7, the tactics didn't work out exactly as he planned and WGM Rohonyan almost managed to turn the tables. Rather than looking at the critical position here, why not watch the team's post-mortem of the game instead. Only SM Sammour-Hasbun was able to score a full point for the Blitz. Jorge is beginning to establish a distinctive style in the USCL, again using up most of his time on the first ten or so moves of the game. This time his opponent, FM Enkhbat, followed suit -- first by arriving late for the game and then by playing the opening very slowly as well. When the tactics finally hit, starting with 22...Nxe5, Jorge saw the implications a few ply deeper than his opponent and was on the verge of coming out a piece ahead when Enkhbat resigned. In the last game of the night to finish, Ilya Krasik needed a half point against WIM Batsettseg in order to secure a match victory for the Blitz. However, it was not to be. From this patzer's perspective, it looked like Black's position was getting difficult as early as move 20 and whether it was the best move or not, I liked the aesthetics of White's 22.Nf5. While Ilya didn't look definitively lost for much of the game, once the passed d-pawn got rolling, the end seemed in sight. A 2-2 draw with a tough division rival and sole ownership of first place -- most teams would have been satisfied, but not the Blitz. When the 2007 schedule first came out, this week's match with San Francisco looked to be one of the stiffer tests for Boston. However, the Mechanics haven't been the same juggernaut they were last season, and currently find themselves in 3rd place in the West, a point behind Dallas. Perhaps one could argue that San Francisco needs this win more than Boston, but then again a loss for the Blitz could drop the home team out of sole possession of first place in the East. It looks as though Boston will be facing an uphill battle on both the middle boards, while NM Williams should have a big edge on Board 4. Therefore, it would seem that GM Christiansen is going to need a win on Board 1 if the Blitz hope to score a full point. This match was originally scheduled to take place on Monday night, but was mysteriously moved back to Wednesday sometime last week. In the absence of an explanation from the league, we can only assume that they didn't want to go head-to-head with this week's round of the 2007 Boylston Chess Club Championship. It was barely audible at first -- a whisper, no less than a whisper, a murmur perhaps. We strained to hear what was being said, as a few others in the crowd began to join in. Slowly the volume rose and suddenly the words broke through. "We want the bear. We want the bear. We want..."
Maybe he's not yet an exterminator, but apparently the Blitz have found a Canadian pest repellent. At last week's Miami Open, NM Chris Williams managed to draw with GM Charbonneau, which is at least as good as, and in some cases better than, the GMs on the Blitz have done against Pascal in league play. Now, all team manager Matt Phelps has to do is figure out how to change the rules so Chris can play on Board 1 or 2. "...the bear. We want the bear." BOOM! Immediately everyone went silent. What was that? BOOM! BOOM! We frantically scanned the crowd unsure whether or not to be frightened. BOOM! There he was, the infamous New Hampshirite with one of those marching band bass drums slung over his shoulders. BOOM! BOOM! The mood lightened and just as suddenly a new chant emerged. "Chris is Awesome! Chris is Awesome! Chris is..."